Pioneer 10 (1973 flyby of Jupiter system). This passed too far away from Europa to get a detailed picture, but the mission did note some variations in albedo (brightness) on the moon’s surface. Pioneer 11 (1974 flyby of Jupiter system). The spacecraft made a flyby of Europa at nearly 375,000 miles (600,000 km) away, only allowing it to see some variation on the surface. Voyager 1 (1979 flyby of Jupiter system). Made a distant flyby of Europa, and also yielded insights about how the gravity of one moon in Jupiter’s system influences the gravity of others. For example, Io’s volcanism was traced in part to interaction of Io with the moons, as well as with massive Jupiter. Voyager 2 (1979 flyby of Jupiter system). One of its major discoveries was confirming brown stripes across the surface of Europa, suggesting cracks in the icy surface. Galileo (orbited Jupiter between 1995-2003). 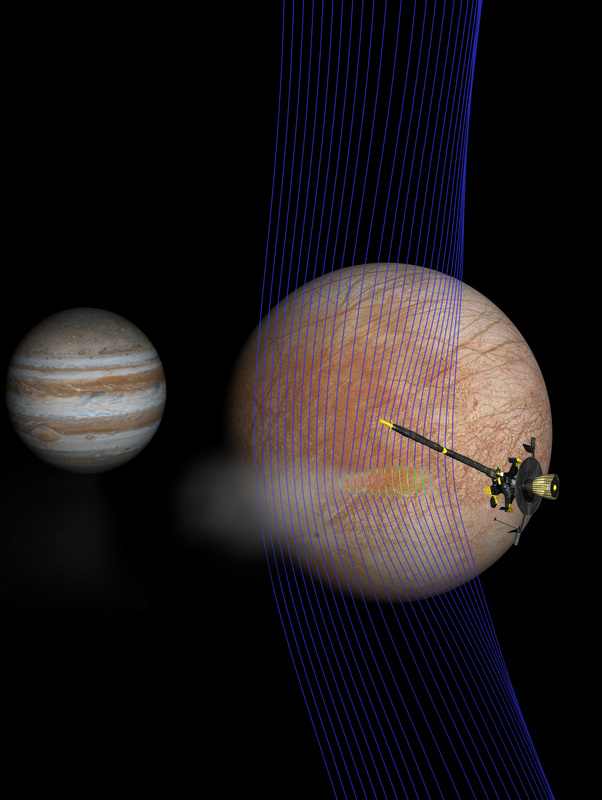 Its most famous discovery at Europa was finding strong evidence of an ocean beneath the icy crust at the moon’s surface. Europa Clipper (proposed for 2020s). Will fly by Europa dozens of times. One of its major goals is to seek out evidence of the apparent plumes that Hubble researchers spotted several times. Giant water plumes have been spotted repeatedly since 2012, the most recent in 2017.